The unregulated inflow in March was 624 thousand acre-feet (kaf) (94 percent of average). March precipitation in the Upper Colorado Basin was 175 percent of average. The release volume from Glen Canyon Dam in March was 790 kaf. The end of March elevation and storage of Lake Powell were 3,569.28 feet (130.72 feet from full pool) 9.05 maf (38 percent of full capacity). The operating tier for water year 2019 was established in August 2018 as the Upper Elevation Balancing Tier. As described in the Interim Guidelines, under balancing, the contents of Lake Powell and Lake Mead are to be balanced by the end of the water year, but not more than 9.0 maf and not less than 8.23 maf is to be released from Lake Powell. Under this Tier the initial annual water year release volume is 8.23 maf, and the April 2019 24-Month Study projects the end of water year elevation at Lake Powell to be above 3,575 feet, and the end of water year elevation at Lake Mead to be below 1,075 feet. 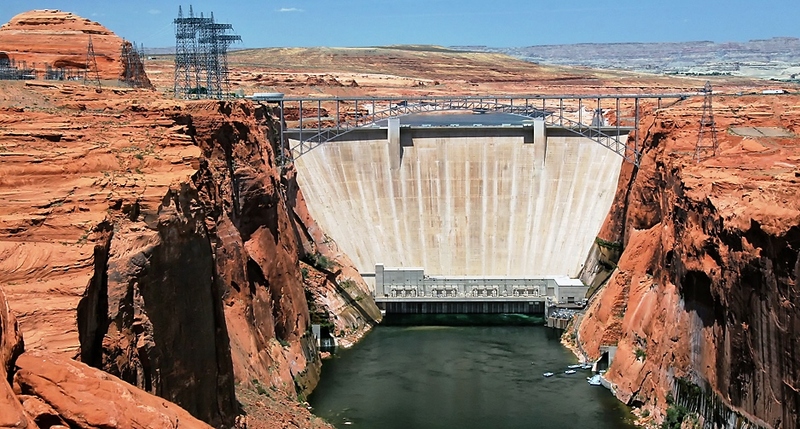 Lake Powell operations will shift to balancing releases for the remainder of water year 2019. Lake Powell is currently projected to release 9.0 maf in water year 2019; and this projection will be updated each month throughout the remainder of the water year. In April, the release volume will be approximately 720 kaf, with fluctuations anticipated between 8,500 cfs in the nighttime to about 15,000 cfs and consistent with the Glen Canyon Dam, Record of Decision on LTEMP (dated December, 2016). The anticipated release volume for May is 720 kaf. 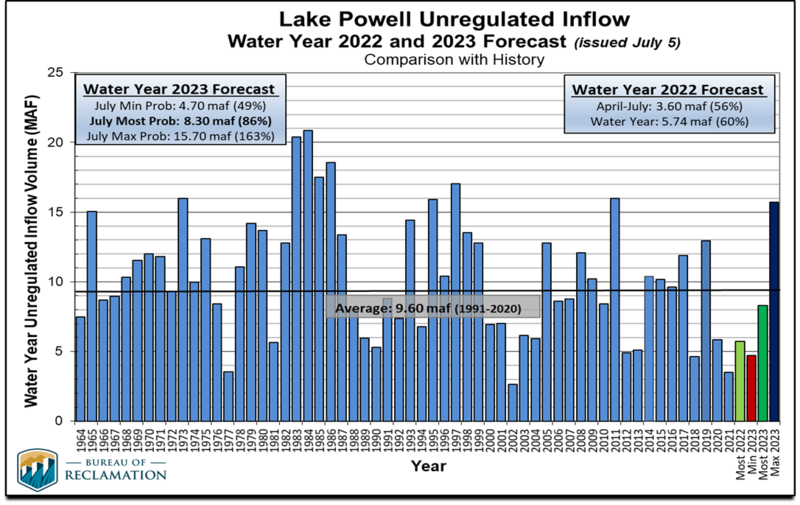 The forecast for water year 2019 unregulated inflow to Lake Powell, issued on April 2, 2019, by the Colorado Basin River Forecast Center, projects that the most probable (median) unregulated inflow volume next year will be 12.11 maf (112 percent of average). 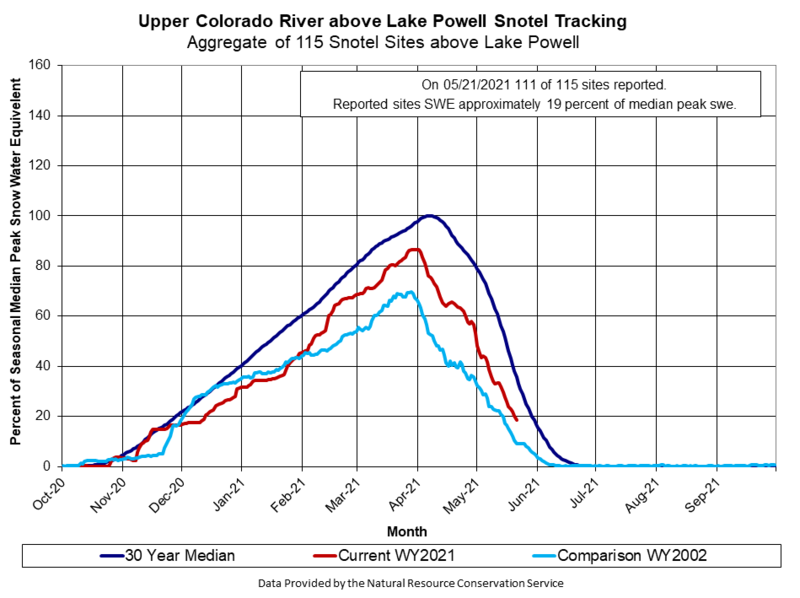 There is significant uncertainty regarding next season’s snow pack development and resulting runoff into Lake Powell. Reclamation updates its minimum and maximum projections four times a year: January, April, August and October. The April forecast ranges from a minimum probable of 9.68 maf (89 percent of average) to a maximum probable of 15.26 maf (141 percent of average). There is a 10 percent chance that inflows could be higher than the current maximum probable forecast and a 10 percent chance that inflows could be lower than the minimum probable forecast. Based on the current forecast, the April 24-Month Study projects Lake Powell elevation will end water year 2019 near 3,611.59 feet with approximately 12.89 maf in storage (55 percent of capacity). Note that projections of elevation and storage for water year 2019 have significant uncertainty at this point in the season. Projections of end of water year 2019 elevation and storage using the minimum and maximum probable inflow forecast from April 2019 are 3,590.25 feet (10.84 maf, 46 percent of capacity) and 3,632.38 feet (15.12 maf, 65 percent of capacity), respectively. Under these scenarios, there is a 10 percent chance that inflows will be higher, resulting in higher elevation and storage, and 10 percent chance that inflows will be lower, resulting in lower elevation and storage. The annual release volume from Lake Powell during water year 2019 is projected to be 9.0 maf under the most probable scenario, and 9.0 maf under the maximum and minimum probable inflow scenarios. The Upper Colorado River Basin regularly experiences significant year to year hydrologic variability. During the 19-year period 2000 to 2018, however, the unregulated inflow to Lake Powell, which is a good measure of hydrologic conditions in the Colorado River Basin, was above average in only 4 out of the past 19 years. The period 2000-2018 is the lowest 19-year period since the closure of Glen Canyon Dam in 1963, with an average unregulated inflow of 8.54 maf, or 79 percent of the 30-year average (1981-2010). (For comparison, the 1981-2010 total water year average is 10.83 maf.) The unregulated inflow during the 2000-2018 period has ranged from a low of 2.64 maf (24 percent of average) in water year 2002 to a high of 15.97 maf (147 percent of average) in water year 2011. In water year 2018 unregulated inflow volume to Lake Powell was 4.6 maf (43 percent of average), the third driest year on record above 2002 and 1977. Under the current most probable forecast, the total water year 2019 unregulated inflow to Lake Powell is projected to be 12.11 maf (112 percent of average). At the beginning of water year 2019, total system storage in the Colorado River Basin was 28.01 maf (47 percent of 59.6 maf total system capacity). This is a decrease of 4.91 maf over the total storage at the beginning of water year 2018 when total system storage was 32.92 maf (55 percent of capacity). Since the beginning of water year 2000, total Colorado Basin storage has experienced year to year increases and decreases in response to wet and dry hydrology, ranging from a high of 94 percent of capacity at the beginning of 2000 to the now current level of 47 percent of capacity at the beginning of water year 2019. Based on current inflow forecasts, the current projected end of water year total Colorado Basin reservoir storage for water year 2019 is approximately 30.62 maf (51 percent of total system capacity). 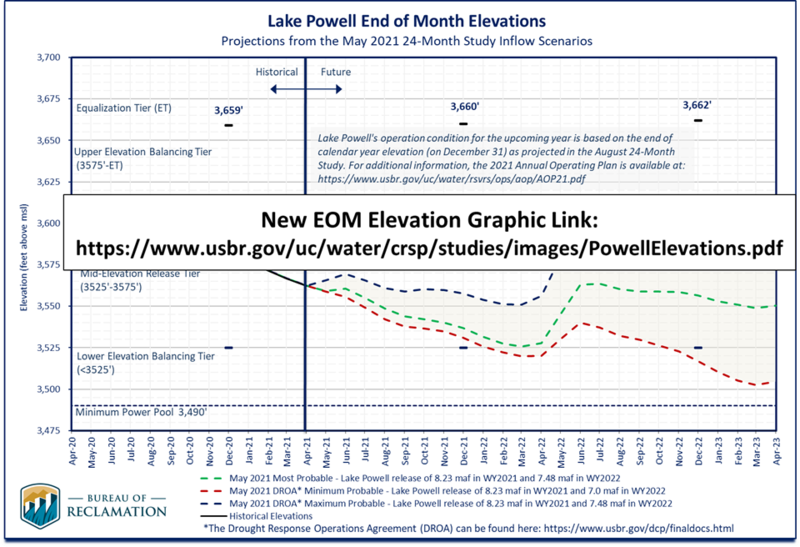 The actual end of water year 2019 system storage may vary from this projection, primarily due to uncertainty regarding this season’s runoff and reservoir inflow.